I love the shabby chic look and have been wanting to create some cards with that theme. I finally had a chance to do just that by taking a class at Paper Tales Friday when my kids were in school. Our teacher was Mona Pendleton and she was a fabulous teacher. I would definitely take another class with her. It's been years since I had taken a class. It was so much fun to be around other stampers. After taking this class, I have fallen in love with dies and glitter all over again. This was one of the cards we did. The papers are from Melissa Frances and the sentiments we used are from MFT. I can't remember what the set is called but the sentiments are so fun to use. Gorgeous! Thanks for joining us at Party Time Tuesdays! What a cool card, love it! Thanks so much for joining our challenge at Phindy's Place this week! 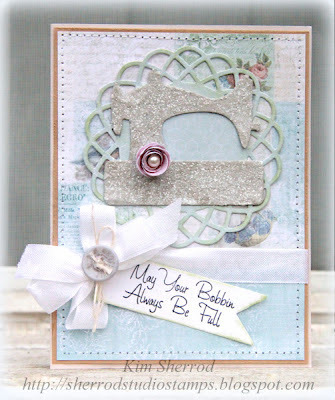 Very pretty, love the soft colors and the use of the glitter. Thanks for playing along with us at Kraftin Kimmies! Very cute card! Love the sentiment! Thanks for joining us at Pennys Paper Challenge. Hope to see you for the next challenge!! Beautiful - love the pastel colours. Thanks for joining us at Pennys.